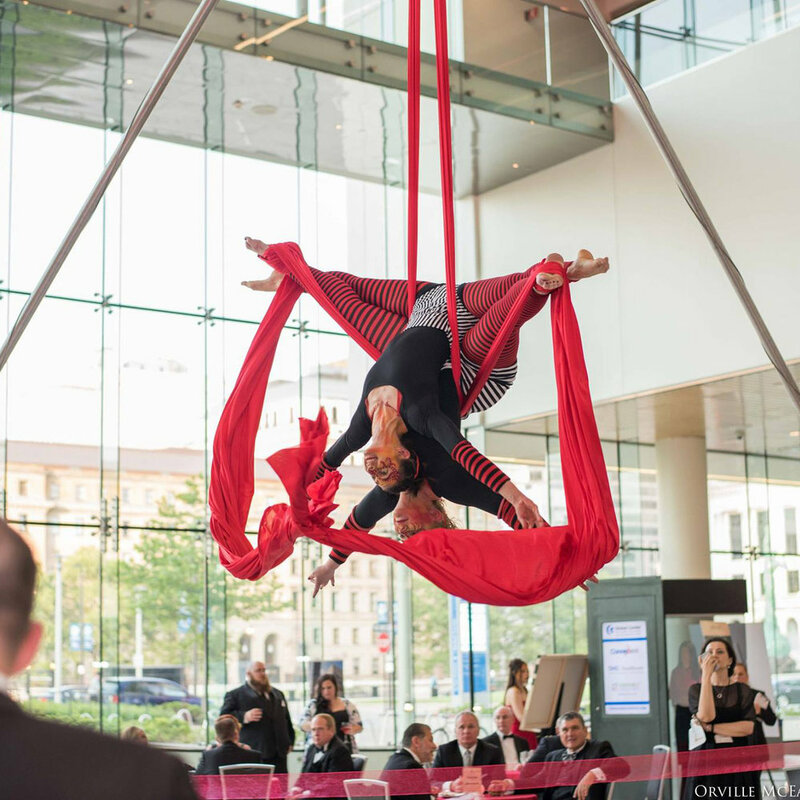 Every year, the American Heart Association hosts a wonderful fundraising gala to celebrate the life saving work of their organization. Community members, medical professionals and corporate leaders gather to recognize all the strides made, the lives saved, and to raise money for the future. This year, I was honored to be invited to create a live event painting of this fantastic celebration. 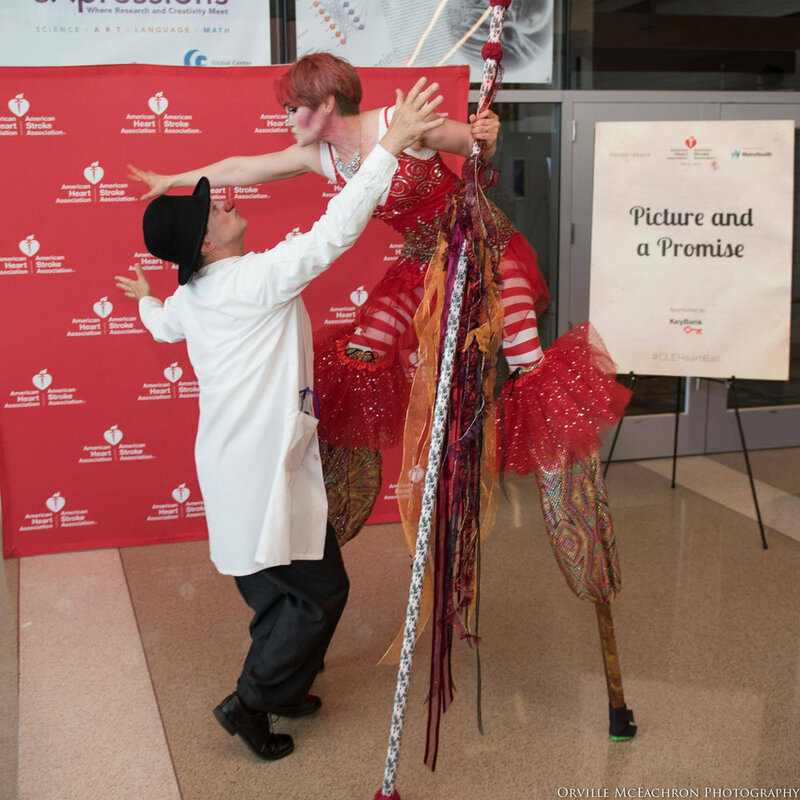 The theme for The Cleveland AHA's 2016 Heart and Stroke Gala was Cirque de Heart – What a fun theme to paint! I can honestly say of all the events I’ve ever painted (or attended for that matter) the event planning staff for this event surpassed anything I had seen before. Unlike weddings, fundraising events are a bit more stressful for me, because they often involve a more strict time restraint. Typically for charity events, my live paintings are part of a raffle or live auction, but at the Heart Ball, I had been specially commissioned to create a painting as a surprise gift for the Chair of the event, Donna Sciarappa. This meant after just 3 hours of painting, I had to be ready to present the painting on stage, in front of everyone! In situations like this, nailing down the composition is even more important from the get go. Luckily, I was able to set up in the perfect spot to take advantage of the angles and perspective of the magnificent atrium. I got to work, furiously painting away until I was notified that my time was up, and I needed to take my seat beside the stage. All in all, I have to admit this was one of my favorite events I’ve ever painted. 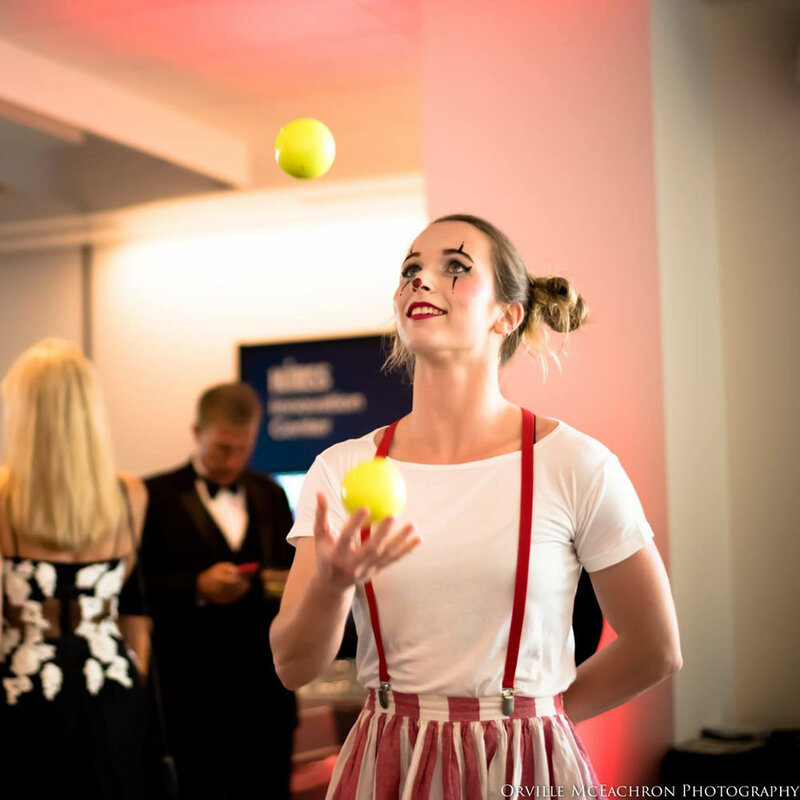 I can’t deny how much I love a good adrenaline rush, and how could painting a glamorous, circus themed gala not be fun? I’ve grown accustomed to painting a lot of blurry faces in my live paintings – not just because it’s faster (ok that’s part of it) but honestly, I just really like the mysterious feeling it adds to the scene. At this event, however, there was no way I was going to ignore the artistry involved in the face paint on all the entertainers! Carrie Escher of Makeup madhouse has some incredible skills. Another shoutout to all the talented entertainers that made this event so unique – StarDrop Circus. They brought a whimsical, unexpected element to the event and were SO much fun to paint! And again, I can’t say it enough, Gail and Joelle, the event planners for this celebration did such an incredible job. They were very happy with how the painting turned out and had the awesome idea to print copies of it in postcard form as Thank You’s for the event! Because I took the painting home and completed it with more detail in my studio, this added another element of surprise for everyone to see the completed piece in a personalized unveiling via their Thank You note. Having had several loved ones suffer from heart disease and stroke, it was really great to have a chance to be involved with the AHA and a cause that is so important to me. I'm happy to say the Cleveland AHA has commissioned me to create another live painting at the 2016 Heart Walk this year, which will be taking place downtown this Saturday. If you're in the area, come join us - It's going to be a fun event for a great cause! Follow this link to sign up, and maybe you’ll end up in my next live painting! Last but definitely not least, a HUGE shoutout to Orville McEachron Photography for taking all these awesome photos of the event! !